Last updated a month ago by hasura . json2graphql is a tool that imports a JSON file to initialise schema and data in Postgres and then allows you to start querying it with GraphQL. Hasura is used to expose a realtime GraphQL API on Postgres. Once your schema and data is imported, you can instantly start running powerful queries with filters, pagination, sorting, fetching relations, insert/update/delete mutations and subscriptions too. 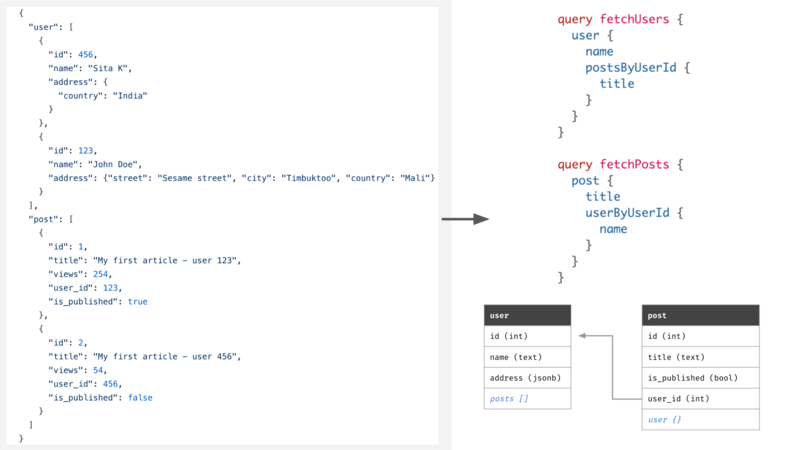 Query existing JSON datasets over GraphQL: Pick up a JSON dataset, import to your new or existing Hasura/Postgres instance and start querying it. Try using jdorfman/awesome-json-datasets. Note the URL. It will be of the form: https://<app-name>.herokuapp.com. Let's say it's j2gtest.herokuapp.com. For instructions on how to deploy Hasura in other environments, head to the docs. The types of the columns/fields are inferred from the data in the columns json2graphql treats top-level objects as tables, and their keys as columns. If it encounters a column name of the form <ENTITY_NAME>_id, json2graphql will consider it a foreign key to the entity with name <ENTITY_NAME>. Note: This assumes that you've already run through the quickstart! You can migrate your data from MongoDB and explore Realtime GraphQL over it. Tweak the MongoDB doc to fit the required JSON structure. Tweak the doc to fit the required JSON structure. You can write your schema and data in JSON format to quickly get a Realtime GraphQL API. For more examples, check out the ./example-datasets directory.